The Fujitsu ScanScan iX1500 exemplifies a niched function done extremely well. With superb scan quality, speed, and reliability, the ScanSnap iX1500 is more than adequate for small businesses and home offices. Though its mobile apps provide fantastic customization options, I do wish its two separate apps could be rolled into one. The cost may be high, but those who’re looking for a scanner in this price range should understand the value of its features. 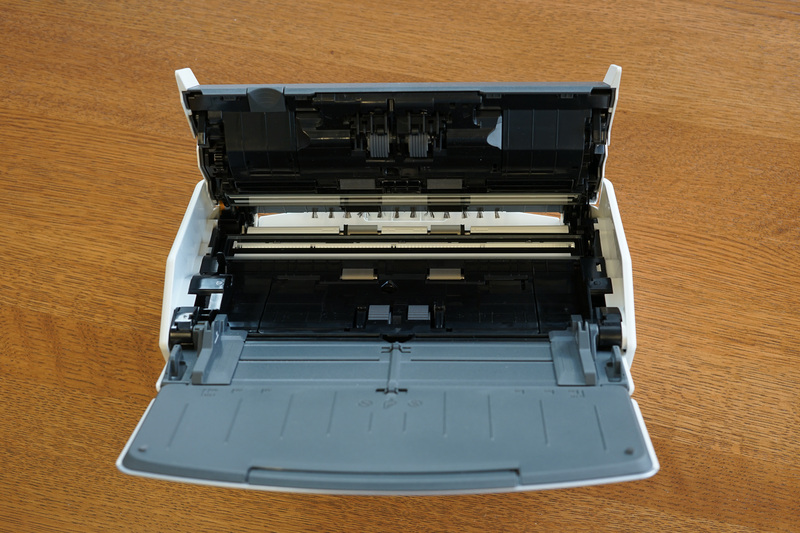 A good scanner can relieve a ton of headaches in converting paper to bits. Its benefits extend beyond simply keeping accounts organized; digitizing reusable documents save paper (and therefore trees) and make mountains of paperwork manageable. The ScanSnap iX1500 scanner is Fujitsu’s best small home office (SOHO) offering. Designed to tackle the workload of a typical small office, this unassuming device can turn 50 black and white documents into searchable PDFs in a minute. In addition to standard A paper formats, it also handles receipts, business cards, and everything else in between. The ScanSnap iX1500 arrived in a deceptively large box, casting the illusion of a behemoth within. After unpacking it, I was pleasantly surprised to find that it’s as compact as an inkjet printer. Uncovering the pristine pearl white shell reveals an LCD touchscreen. This is the only input method on the ScanSnap. Contrary to the crappy touchscreens usually installed on printers, the one on the iX1500 is very responsive and easy to read. The scanner’s setup process is straightforward and painless. After configuring the initial settings, the scanner can attach itself as an access point to the local network, or connect directly with a device via a USB type B cable or a discrete WiFi connection. To operate the scanner wirelessly, download the Fujitsu ScanSnap software on all connected devices. As simple as the configuration may be, my initial attempts at pairing my Google Pixel 3XL proved unsuccessful. After fumbling with the settings panel to no avail, restarting the scanner somehow amended the issue. I controlled the scanner through the direct wireless connection mode, and to my knowledge, only one device can pair with the scanner at any one time. To surmise, setup wasn’t particularly challenging, which is a good thing since operators need minimal interruption to workflow. Transitioning to this scanner in an office environment should demand minimal training for its users. It’s very rare that we review scanners, and the Fujitsu ScanSnap iX1500 is a first for me. As such, I don’t have an established baseline to compare it to. With that said, the scanner is seriously advanced and eats through documents extremely quickly. The ScanSnap iX 1500 accepts just about every paper stock type. As long as they fit in the chute, it doesn’t care to differentiate between vinyl, gloss, or standard, and churns through them all the same. It even managed to properly scan a credit card. It also adequately handled mixed paper sizes within the same feed batch. I tossed in a stack of paper consisting of A5, A6, A8 document sizes without much care, and the iX 1500 still produced excellent results. To test how fast it can go through a set of standard A8 paper, I filled its chute with 24 pieces of documents. On the auto scan setting, the iX 1500 finished scanning in about 40 seconds. Impressive. The scanner also comes with a business card and receipt feed bracket. The bracket can only fit about 16 standard business cards at once, which is more than enough unless you have a stash of hundreds of cards. Scanning speed was on par with the paper documents. Through the ScanSnap Cloud’s optical character recognition function, the ScanSnap iX1500 can automatically categorize scanned pages into documents, photos, and receipts. It can also render them into searchable PDFs. I tested its quality using several common business fonts including Times New Roman, Calibri, Arial, and Comic Sans. The results are mixed; even when set to the best scan quality, Google Drive’s PDF search function has trouble picking up search terms, especially ones with a mix of numbers and text. They’re perfect legible to a human reader, though. Scanning receipts is tricky business. Not only are they often crumpled, but receipt papers are often razor-thin so bleedthrough is a serious issue. This often stumps many scanners, and unfortunately, the ScanSnap iX1500 is the latest victim. It’s unable to filter out pages with texts that bled through the back side, forcing me to manually delete a ton of useless sheets. Being able to control the scanner wirelessly through a mobile device proved to be very handy. Not only do the scanned results get sent directly to the mobile device, the mobile app also provides robust custom profile settings. Through the app, users can adjust the compression rate, image quality, document format, and whether or not to skip blank pages. If the documents need to be shared immediately, the app can also be linked with cloud storage services like Google Drive and Dropbox. Over time, the roller can become caked with dust and gunk, so I appreciate that Fujitsu made it easy to access on the ScanSnap iX1500. When the front cover is peeled back uncovered, the rollers can be turned using the Run command in Cleaning Mode. Just brush off all the dust on the rollers and voila, good as new. Even in the hands of the tidiest users, rollers inevitably get worn out. Fortunately, the ScanSnap iX1500’s rollers are easily replaceable. According to the printer, each set has a 200,000-page lifecycle. If we’re generous and assume that it goes through 100 pages a day, it should still last just under five and a half years. Sorting documents individually can be extremely exhausting and time-consuming. To alleviate the arduous task from its user, Fujitsu provides the ScanSnap cloud service, which sorts the scanned documents to business cards, pictures, documents, or receipts based on their content. The service is entirely optional, so doctors who handle sensitive medical record don’t have to use it if they feel like it carries security risks. Fujitsu assured me that data is only stored for transient purposes, and all uploaded document is securely erased upon successful delivery to the recipient. Going for $639, the ScanSnap iX1500 is just shy of a large industrial scanner. There are no complaints when it comes to function: it’s reliable, fast, and quiet. Although certain software may see the searchable PDFs as less than perfect, no human with functioning eyesight would have trouble discerning the texts. With that said, I do wish the two mobile apps could be combined into one, or at least let me upload previously scanned PDFs to the ScanSnap Cloud. For those who are trying to organize a law office, design studio, or anyone who has to digitize print as a part of their day, the Fujitsu ScanSnap iX1500 is worth its weight in gold.